Chocolate Chip Oat Cookies have a nice soft center with slightly crisp edges and are filled with bits of chocolate and oats. Confession… something has happened to me in the last six months and I now love chocolate chip cookies! Shocking I know, to hear this statement coming from someone who once professed their disdain for cookies. I don’t know if it was the pregnancy or the chocolate? but I keep trying different recipes in search of the “perfect” cookie, I like mine soft, slightly chewing and loaded with chips. I can’t seem to stop wanting chocolate chip cookies, but lately I have been trying to cut back on the amount of chocolate I eat. This baby weight won’t lose itself and as the author of a baking blog I feel I am at a slight disadvantage. However I do believe in eating the things you love in moderation and a piece of chocolate a day is good for your health in my opinion. These cookies came to be a couple of weekends ago when I needed something to bribe some helpers with, we had a piano given to us and needed some muscle to get in into the house. Dozens of cookies later our three helpers and my husband moved to piano in and they left happy with bags full of these delicious cookies. Soft centers with slightly crisp edges these cookies are filled with bits of chocolate and oats – they are sure to satisfy your cravings and mine. Enjoy and happy baking! Preheat your oven to 350º and line baking pans with parchment, set aside. In the bowl of your stand mixer cream the butter and shortening for a minute, then add the brown sugar, baking soda and salt. Beat until combined; scrape down the mixture and add the eggs and vanilla and beat 30 seconds. Add the flour and oats and beat until it comes together, stir in the chocolate chips. Scoop 1 Tbs of the dough onto the parchment, spaced 2" apart and bake for 7-8 minutes; until the edges just start to crisp. Cool on the pan 1 minute, transfer to cooling racks and cool completely. OOH, these look goooood! They almost look a little bit like the soft-baked variety! I am so glad you are pro-cookie now! These look sublime. My favorite chocolate chip cookie is that one that’s all over Pinterest: Brown Butter Nutella Stuffed Chocolate Chip Cookies. Holy cow, are they good. Can’t wait to try this one out! Emily, glad to hear you have crossed over to the chocolate chip cookie side! 🙂 These look wonderful – I love soft cookies. Thanks for sharing your recipe and pinning! These sound good–I think I’d move a piano for a bag of them! Glad you’ve come around to the chocolate chip cookie way of life–now there’s no going back! Oh yum- I love when they are crispy on the edges and soft and gooey in the middle! Sound good!! Yum, yum and YUM!I love soft centers and crispy edges! Thank you so much, Emily, for sharing these beautiful cookies at Best of the Weekend! Pinning to our party board! Have a great weekend! I saw these on Best of Weekend, they look so good! Chocolate chip cookies are my weakness, especially ones with soft centers. Thanks for sharing the recipe! Oh my gosh. These look amazing! I’m going to have to give these a try with my kids this week! I hope you like them as much as we did Suzanne! 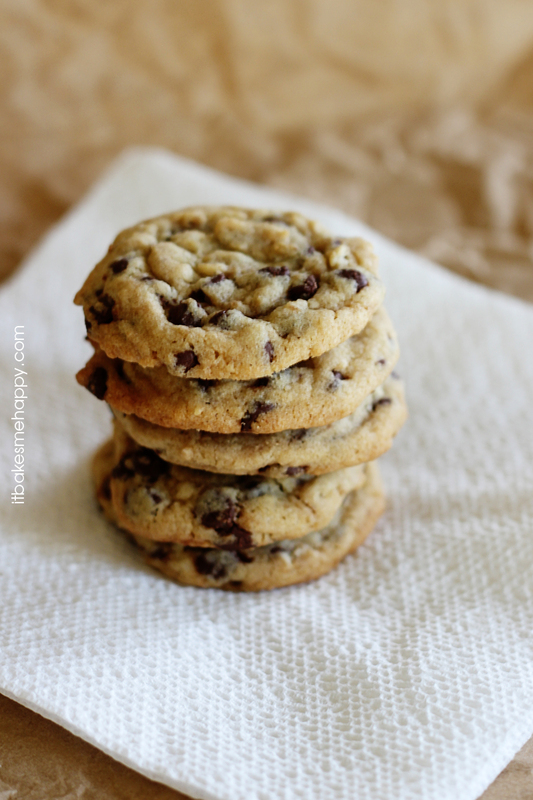 I love chocolate chip cookies – these look great!! I doubt I could stop at 2 or 3… Pinned! I’m off to pin these now, thanks for sharing!